During the holidays, and really throughout the entire year, it's nice to have a super easy appetizer in your back pocket. One that you can make on short notice - like if you have last minute guests stop by, or if you forget that you're supposed to bring a dish to share to a meeting, party, or event. Or if you don't have time to make anything time-consuming. We've all been there. Let this be your "go-to" appetizer. It is embarrassingly easy, pretty and festive, and always well-received. Do you need more convincing? It's equally tasty fresh out of the oven, at room temperature, and chilled. Oh, and it only calls for three ingredients. Goat cheese and pepper jelly are a great combination (try it on a grilled cheese and thank me later). 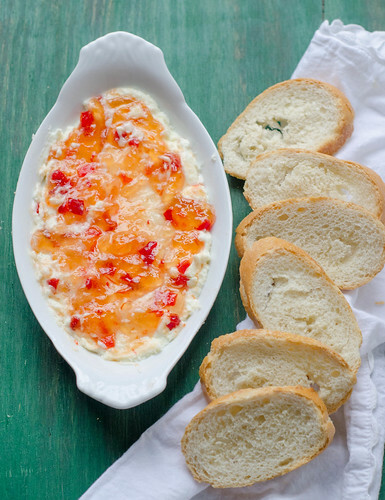 Creamy, tangy goat cheese + addictively sweet and spicy pepper jelly spread on a piece of crusty bread? This is a winner all around. Preheat the oven to 400 degrees Fahrenheit. Combine the goat cheese, cream cheese, and salt in a medium bowl, mixing well to combine. Spread in a lightly greased 8x8 inch baking dish or other small baking dish. Whisk the pepper jelly in a small bowl to smooth out any lumps, then spread in an even layer over the cheese. Bake 7-8 minutes, then turn on the broiler and cook an additional 2-3 minutes, until the top is bubbly. Allow to cool slightly, then serve with toasted baguette slices or crackers. I was wondering what I could do with the leftover soaked chickpeas after I had made Corn and Bean Tamale Pie,glad there were lots. I love pepper jelly, but have only put it on cold stuff. This looks great! I have everything for this. I know what's for lunch! This contains all the keys to my heart. Yum! Ooh, such a pretty dish! I love how this classes up the quick & easy cream cheese & jam combination. Oh my gosh, this looks right up my alley. I totally need to bring this to Christmas. Mmm! I love pepper jelly, I can't wait to try it on goat cheese! I feel like I've had this recipe bookmarked since F&W published it! Two of my favorite things in one ooey gooey bowl. This i so perfect. I'd better only make it when I've got a crowd coming, otherwise I might eat it all by myself. well as giving it a try myself. Looks delicious! her, as well as giving it a try myself.